blogging – Media! Tech! Parenting! Blogging can be a solitary endeavor, so it’s exciting when another cool website publishes a blogger’s thoughts and ideas. Over the past several weeks I’ve had two blog posts published over at A Platform for Good (PFG), a part of the Family Online Safety Institute (FOSI). PFG aims to encourage parents, kids, and educators to connect with one another and think about “doing good” in the digital world. The website and the blog focus on a range of interesting topics with lots of ideas on digital parenting, learning, growing up in today’s world, and many other authentic opportunities — all great for us to have access to in a connected world. 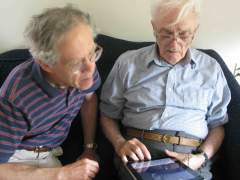 My dad shows my husband how to write journal entries on an iPad. In October 2009 I began work on AsOurParentsAge.net, with lots of encouragement from my husband. His mother, Betty, was near the end of her life. Essentially, helping to care for her filled up our non-work times and had for over two years. When we were not at our jobs, we were assisting Mother in some way. I started writing, initially, about topics that we wished we, as adult children, had known more about before we became caregivers to an elderly parent. About a year later I began writing for MediaTechParenting.net, a blog that reflects my professional interests and work. One blog relates to my vocation, the other to an avocation. Bottom line? Nearly 1000 posts later — a few of them posted on more obscure blogs — I still seem to have lots to say as I use this 21st Century learning and communication tool.